When you can’t get to the range for whatever reason, there is a variety of equipment to help you practice your swing — in your basement, garage, family room or the backyard. Perhaps, the simplest of all training tools is the practice golf ball. The best practice golf balls simulate hitting a real golf ball, but do not travel as far, and are usually made of softer material. 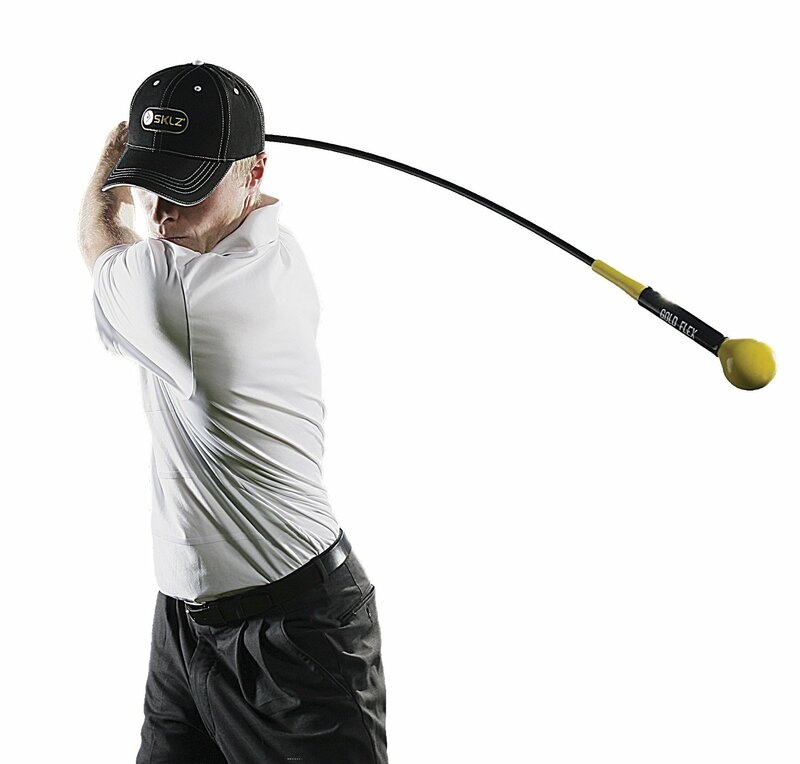 This allows you to practice your swing in a small area (i.e. your backyard, basement, local park, etc.) without worrying about damaging nearby houses, cars, or people. Just make sure you have enough space to swing (and watch out for lights)! Construction and design – Practice golf balls are made with a variety of materials and designs. The best ones will not damage property (cars, windows, etc.) or injure anyone when you hit an errant shot. Distance – Not all practice golf balls travel the same distance when hit. Some will be better suited for the backyard, others for the public park and some for indoor use. Feel and flight – Some balls give very little feedback and does not mimic real ball travel very well. Look for ones that do this well. You can practice your swing to your heart’s content with these Callaway practice balls. They simulate actual ball flight flawlessly thanks to the patented HEX dimple pattern. They are safe to use anywhere thanks to the soft foam construction which will not damage any nearby buildings (or break your windows). The material is also durable, and will not crack after a few hits like some other cheap practice balls. The HX Practice Balls fly about 30% to 50% of the distance of normal golf balls. So, make sure you have enough space if you are taking a full swing. 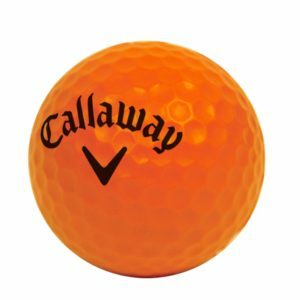 You can buy the Callaway HX Practice Balls in either packs of 9 or 18 and and in a variety of colors (orange, yellow, or pink). Overall, the realistic ball flight, durability, and soft/safe material makes this one of the best practice golf balls on the market. Buy the Callaway HX Practice Balls here! Want cheap? 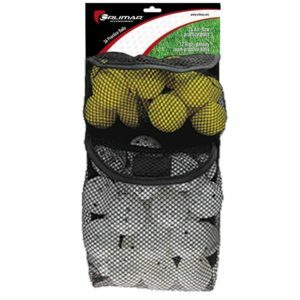 These balls from Orlimar Golf come in a giant pack of 36 — 24 plastic balls with air holes (wiffle balls) and 12 balls made from high density foam. You can use them inside and outside and you’ll definitely improve your swing without inflicting damage on your surroundings. These balls are perfect for the backyard as their distance is limited. Unfortunately they sacrifice some of that “real feel” and you don’t get an idea of the distance and trajectory of the ball, especially on the plastic “wiffle” balls. But overall they are great for practicing your swing at home, and keeping in shape during winter months. One downside is that the plastic balls tend to get damaged quite easily. For just around 30 cents per ball though, you won’t find much cheaper practice golf balls than these. Buy the Orlimar Practice Golf Balls here! What the h*ll is this? You’ll be forgiven for looking at this bracelet shaped object with some serious apprehension. Despite its odd shape, the Birdie Ball is one of the best practice golf balls out there. Hitting it feels like hitting a real golf ball, and it even flies on a realistic trajectory. Since it acts just like a real ball you can even practice a variety of shots with it. Draw it, fade it, and spin it…just like a real golf ball! The only difference is that the Birdie Ball is limited to fly around 40 yards, so it is great for taking to your local park or even in your own backyard (if its big enough). You can take a full swing and not worry about it flying 200 yards away. The ball itself is made from a “super polymer” which will not cause damage to windows, people, or anything else in case you mishit. It is also extremely durable and will not break easily like the cheaper plastic wiffle balls. The only downside is that these are a bit expensive relative to other practice golf balls. The 12 ball pack should last you a very long time though, so you can look at it as a long term investment. As unconventional as the Birdie Ball may look, they are probably the best practice golf balls on the market. Give them a shot! Just want something that is cheap and practical? Then, these practice golf balls from PrideSports may be for you. Made from soft dimpled foam, these balls are great for indoor and outdoor use. The soft material makes them fairly safe to hit anywhere as they won’t damage anything or hurt anyone. The balls fly straight if hit properly, so you can get an idea if you are making correct ball contact. They can also carry a fair distance if hit well, so be careful when taking full swings! One downside is that they are a bit too soft for some golfers, so they lack the “real feel” of impacting a golf ball. Despite this, they are still great for practicing your swing overall and keeping fit in your off time. They are especially great for practicing indoors on a rainy day. Currently on sale for a ridiculously low price of only $4 for 12 balls ($0.33/ball), you can’t really go wrong with these. Buy the PrideSports Practice Foam Golf Balls here! 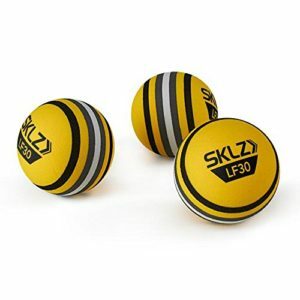 The LF30 Practice Golf Balls are just another great training product from SKLZ. These bright yellow orbs are painted with alignment stripes to help you improve your setup consistency. They also allow you to see how the ball spins when you are practicing your short game. The LF30s are made of a soft foam that feel solid to hit, but will not cause any damage to your walls or windows. They also fly true and straight like a normal golf ball, but go only around 30 yards. Overall, the SKLZ LF30s are great practice golf balls, and are very reasonably price at about $12 for a 12-pack. Buy the SKLZ LF30 Practice Golf Balls here! They look like golf balls, hit like golf balls, and fly like golf balls, but they’re not quite golf balls. They’re Almost Golf balls! These practice golf balls are one of the most highly rated products on the market. The main reason customers love this ball is that they feel and fly off your club just like a real golf ball. The dense foam construction allows the ball to ‘pop’ off your club, giving you a more realistic feel on impact. You can also spin, fade, and draw it just like a real golf ball. The foam is quite firm, but soft enough so that it won’t break any windows or dent cars. Perhaps one downside of the Almost Golf ball is that it can fly quite far — about 50% the distance of a normal golf ball, up to around 100 yards. So, make sure you have enough space in your yard if taking a full swing. Overall, these are just another great practice golf ball. They are also reasonably priced at about $15 per dozen. 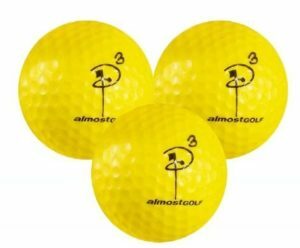 Buy the almostGolf Practice Golf Balls here! 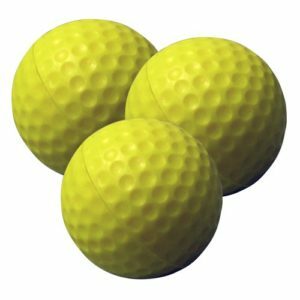 Buy the pack of 36 almostGolf Balls here ($35) ! With the best practice golf balls, you can practice your swing almost anywhere, and anytime. No need to rush out to try and rush out to the driving range after work or after dinner! There is a good mix of quality and affordability on this list, so you are bound to find something that suits your needs. Let us know which is your favorite! What is the Best Golf Mat? What is the Best Golf Practice Net? What’s the Best Golf Swing Trainer? What are the Best Golf Balls for Women? ‹ What are the Best Golf Shorts? Great Review. Soft limited flight balls are great. I use soft balls on the optishot in the house. My experience is the Callaway orange balls leave a small orange smudge on the wall if you miss the screen. Yes, the solution is to swing better and not miss the screen. The yellow balls are nice and haven’t left a mark on my walls yet even though I have hit the wall.